SANTA BARBARA - SEPT 9 - Small yachts racing beside the Santa Barbara pier on Sept 9, 2012 Santa Barbara, USA. First built in 1872, the wharf ranked as the longest deep-water pier. hd00:11SANTA CRUZ, USA - SEPT 12 - Small yachts racing on the Pacific Ocean on Sept 12, 2012 Santa Cruz, California, USA. 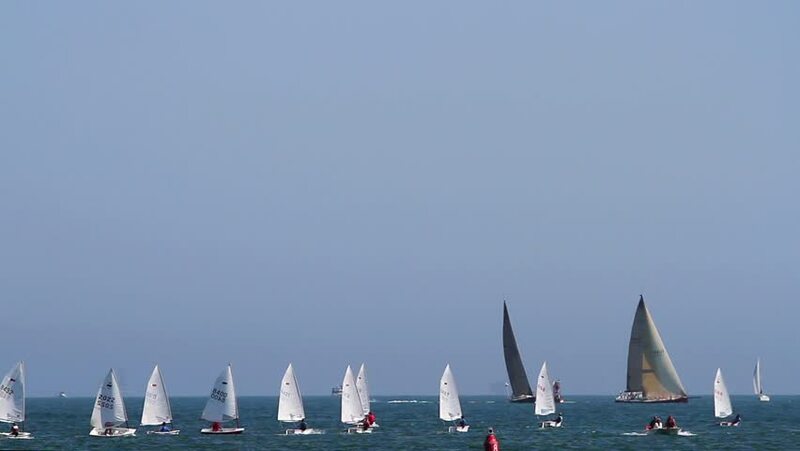 Wednesday night sailing races are very popular in California. sd00:44CIRCA 1970s - A picture is used to explain how the front lines artillery will operate in case an enemy intrudes in the 1970s. 4k00:20Russia, Saint-Petersburg, Lakhta, 04 June 2018: Aerial survey. Skyscraper Lakhta Center. Modern glass architecture for the World Cup. Business center on the beach. Baltic Sea or the Gulf of Finland. hd00:15WIRRAL, CHESHIRE/ENGLAND - JUNE 12: A sailing dinghy tacks round a buoy on West Kirby Marine Lake on June 28, 2012 in Wirral. The Marine Lake is a man made coastal lake fed by the sea at high tide. hd00:30Two of a sailboat floating under a clear sky. Lake with blue water.